Port of Oswego – Oswego, New York | World Shipping, Inc. The Port of Oswego is the first U.S. port of call and deepwater port on the Great Lakes from the St. Lawrence Seaway. Located on Lake Ontario on route to the interior of North America, the Port is accessible from any international port in the world. The Historical port is also home to Oswego Marina, the H. Lee White Marine Museum, historic maritime district, and fourteen companies that call it home for its domestic and international operations. The Port of Oswego’s strategic location at the crossroads of the Northeastern North American shipping market. Extend that to 750 miles and you’ll reach half of the United States and Canadian population, and half of their business and manufacturing facilities. The location is at the Southeastern point of Lake Ontario allowing the Port to be a leader not only as a domestic partner, but as a leading international port. The Port is proud to be one of the most productive ports in North America with nearly 120 vessels and more than one million tons of cargo moving through the port on an annual basis. With international clients and cargoes that span the globe from Brazil and Netherlands, to Russia and Indonesia, prove that the Port of Oswego is an international contender. Free of coastal port congestion and large city traffic, the Port is able to offer all our international and domestic shippers virtual year-round access to various Northeastern United States industrial and agricultural markets. 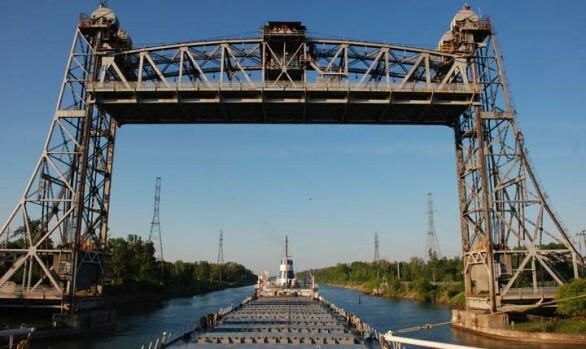 As an ice free port, the Port of Oswego can receive vessel traffic 12 months out of the year, with deep draft vessels arriving from the North shore of Lake Ontario even when the St. Lawrence Seaway is closed to navigation. The Port is open 24 hours a day, seven-days a week to accommodate vessels from all ports on the Great Lakes and around the world. The port entrance depth is 27 feet, a width of 750 feet, a turning basin of 115 acres and it has no restrictions on beam length for ships entering the harbor. The port hosts a U.S. Customs service office to facilitate the movement of legitimate international cargo by rail, truck and water.